Darktable, available in several languages, that are automatically invoked, according to the operating system it detects, follows a modularized workflow. 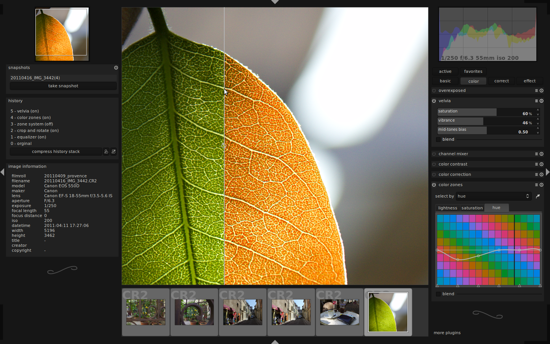 Lighttable lets you do administrative tasks in the likes of Bridge or Picasa or … Lightroom. Meta-data can be viewed and changed. Categorization can be done from here, as well as sorting operations in a variety of ways. The module darkroom is responsible for the manipulative work. As darktable is limited to tasks that real photographers would do in real darkrooms, we don’t have the opportunity to work on collages or other montages. All effects, corrections and related functionality can only be invoked on photographs. Darktable’s methods are powerful and very finely tunable. The results are often described to be better than what can be achieved using so-called professional software such as Lightroom. The last module, called tethering, is used to connect cameras to Darktable in a way that their contents can be imported automatically. Freshest member of the family is the Darktable-version for Mac OS X, which is available as a DMG using this link. If you read the blog entry that announces the availability of the Mac-version, you’ll feel flooded with comments of users stating to have a wide variety of problems using, configuring, but also even installing the app. Gotten insecure from the comments I mentioned before, I decided to give Darktable a spin, so none of our readers would run into trouble and probably blame me for having gotten their MacBooks damaged. I installed Darktable as is usually done using the downloaded DMG. Darktable went from a lean 15,5 MB DMG to a not so much fatter 52 MB app. And I did not experience any problem whatsoever. 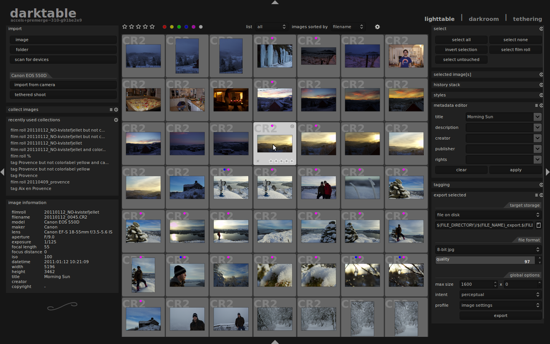 I imported over 1.000 pictures into lighttable and I was able to fire effects and filters at chosen pictures without any misbehaviour on the side of Darktable. Everything worked absolutely flawlessly, until I tried to connect my camera via the tethering-module. I couldn’t get that to work, but a workaround for this problem is already in existence. As I never use automatic importing of pictures, I didn’t give this workaround a spin, though. The recent version of Darktable carries the number 1.05. The whole project is organized professionally und comes with a documentation, that leaves no stone unturned. You should definitely check out the project’s ressources-section. @ Smn : LOL ! I had the same problem with te UI but the I discovered Gimpshop, much more like Photoshop’s layout. But becareful when you install it as it tries to install lot’s of other stuff like yahoo toolbar so make sure you decline all those offers! Speaking as a Linux user here, I’d add that 4GB RAM is a recommended minimum for darktable. Of course, it depends on what plugins you use, but using it on 2GB is too much pain. P.S. The name is officially all lower-case, darktable, but few people care. Indeed. I’ve been using darktable on a not-that-old machine for a year now, but 2 Gio is not nearly quite enough. I can manage to work as it is, but when it comes to exporting pictures, I can but shut the GUI and use a bash to work out my shots with darktable-cli. Apart from this point, darktable is truly a great tool, even if I miss some features or at least some quality features -vintage effects for example: I never succeeded in making the splittoning effect produce what I want- it is from far the best software I found on Linux to use on my shot! Very interesting features. You introduce a new software to manage / edit your RAW images and yet they manage to copy Lightroom’s interface. Why? Like to auto-exposure feature though. I have fallen in love with darktable. It’s an amazing program that I use on Slackware Linux and Fedora Linux with 4gb RAM and it runs amazingly well. I’m excited to get some Mac users introduced to it. Can you tell me what is the easiest alternative to lightroom to use ? I just want to be able to check instantly the photos that I take for my online shop and reduce the size to make them usable without any work. Which software can do that easily, I am a newbie and I am not interested in wasting time learning how to use a new program.